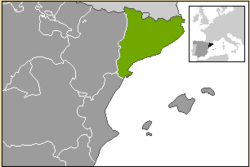 Catalonia is an Autonomous Community in northeast Spain. It covers an area of 12,399 square miles (32,113 km²) and has an official population of 7,364,078 according to a 2008 census. More than one-third of Catalonia's population lives in Barcelona, the capital city. Official languages are Catalan, Spanish, and Aranese. Modern Catalonia is an autonomous region within Spain. It has an older history as an independent territory of the Crown of Aragon, which in some ways predates Spain itself. In the late nineteenth and early twentieth centuries Catalonia was a center of socialism and anarchism. Catalan separatists established an autonomous republic (1932–1938) that opposed Francisco Franco's loyalist forces during the Spanish Civil War (1936–1939). The region regained its autonomous status after Franco's death in 1975. Catalonia continues to press for more political and economic autonomy, mainly in the form of the right to collect and spend more of its taxes locally. This has been the source of some conflict with other regions of Spain. With 25 percent of the gross national production, Catalonia is the principle Spanish industrial region. The name Catalunya (Catalonia) began to be used in the twelfth century to refer to the group of counties that comprised the Marca Hispanica, which gradually became independent from the French. The origin of the term is subject to diverse interpretations. The prevalent theory suggests that Catalunya derives from the term "Land of Castles," having evolved from the term castlà, the ruler of a castle. This theory, therefore, suggests that the term castellà ("Castilian") would have been synonymous. Another theory suggests that Catalunya derives from Gothia, "Land of the Goths," since the Spanish March was one of the places known as Gothia, whence Gothland and Gothlandia theoretically derived, though critics usually consider it rather simplistic. Yet another theory points to the Lacetani, an Iberian tribe that lived in the area, and whose name, due to the Roman influence, could have evolved to Katelans and then Catalans. 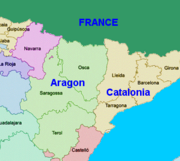 Catalonia borders France and Andorra to the north, Aragon to the west, the Valencian Community to the south, and the Mediterranean Sea to the east (with a 580 km coastline). Because of its geographical location and range of habitats, including dryland steppes, rocky coastlines, mountains, and some of the most important wetland sites in Europe, Catalonia has a greater variety of bird life than anywhere else on the peninsula. The Ebro delta is the most important wetland area on the Spanish Mediterranean coast and the second largest in the Iberian Peninsula. It attracts millions of birds throughout the year. The delta contains several natural habitat types such as lagoons of varying salinity and depth, dunes, shallow beaches and bays, as well as the river and its riparian woodlands. The Costa Brava, in the northeast, has rocky cliffs and a mix of pebble beaches and sandy beaches. The Costa Daurada (Golden Coast), in the southeast, has sandy beaches. The Pyrenees, in the north on the border with France, contain several national parks. The Terres de l'Ebre, in the south, has two national parks and a river delta. 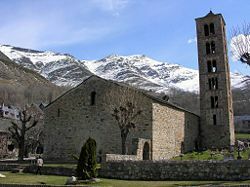 The Medieval church, Sant Climent in Taüll, which is located at the foothills of the Pyrenees. 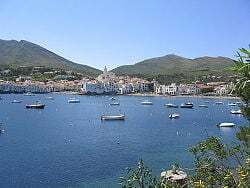 The quaint town of Cadaqués, a popular tourist destination, is located on the Mediterranean coast. The main economic importance of the Catalan rivers is probably the role of their valleys as communication routes, particularly through the Coastal and Prelitteral Ranges. Hence, routes inland from Barcelona pass either through the valley of the Llobregat or that of the Besòs, and the Francolí valley is an important route inland from Tarragona. All of the larger rivers, with the exception of the Llobregat, have been dammed for hydroelectric power. By far the largest dams are those on the Ebro (Ebre in Catalan). The rivers can be classified into four groups according to their source. The frontier between Catalonia and the Valencian Community is formed for much of its length by the Sénia, while the Noguera Ribagorçana forms the frontier with Aragon for much of its length. The Congost de Mont-rebei is a spectacular gorge through which the Noguera Ribagornza runs, dividing Catalonia from Aragon. The only way through is along a mule track, much of which is dug out of sheer rock. The walls of the gorge reach heights of more than 500 meters with a minimum width in places of 20 meters. Irrigation is important in the drier areas of Catalonia, notably in the Central Depression and in the south. 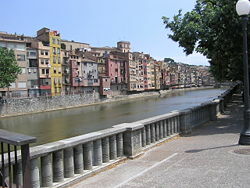 The Canal de Aragó i Catalunya and the Canal d'Urgell distribute the waters of the Segre across the comarques of Noguera and Segrià, where it is used for growing cereals, almonds, and olives. Irrigation is also important in the comarques of Baix Ebre and Montsià, where the cultivation of rice is widespread. The Ebro delta is dominated by rice fields, but the delta also contains small fruit plantations and salt pans. The climate of Catalonia is diverse. The populated areas by the coast in Tarragona, Barcelona, and Girona feature a Mediterranean climate. Inland areas have a mostly continental Mediterranean climate. The Pyreneean peaks have a mountain or even alpine climate at the highest summits. In the Mediterranean area, summers are dry, hot, and humid with sea breezes, and the maximum temperature is around 30°C. Summer is the rainiest season in the Pyreneean valleys, with frequent storms. Winter is cool or cold depending on the location. It snows frequently in the Pyrenees, and it occasionally snows at lower altitudes, even by the coastline. Overall, spring and autumn are typically the rainiest seasons. Inland Catalonia is hotter and drier in summer. Temperature may reach 35°C. Nights are cooler than at the coast, with the temperature around 14° to 16°C. Fog is not uncommon in valleys and plains, with freezing drizzle episodes during winter by the Segre and other river valleys. Like some other areas on the Mediterranean coast of the Iberian Peninsula, Catalonia was colonized by the ancient Greeks, who settled around the Roses area. Both Greeks and Carthaginians (who, in the course of the Second Punic War, briefly ruled the territory) interacted with the main Iberian substratum. After the Carthaginian defeat, the region became, along with the rest of Hispania, part of the Roman Empire, with Tarraco becoming one of the main Roman posts in the Iberian Peninsula. After Rome's collapse, the area was subject to Gothic rule for four centuries. In the eighth century, it came under Moorish al-Andalus control. After the defeat of Emir Abdul Rahman Al Ghafiqi's troops at Tours in 732, the Frankish Empire conquered former Visigoth states that had been captured by the Muslims or had become allied with them in what today is the northernmost part of Catalonia. Charlemagne created in 795 what came to be known as the Marca Hispanica, a buffer zone beyond the province of Septimania made up of locally administered separate small kingdoms that served as a defensive barrier between the Umayyad Moors of Al-Andalus and the Frankish Empire. The Catalan culture started to develop in the Middle Ages stemming from a number of these petty kingdoms organized as small counties throughout the northernmost part of Catalonia. The counts of Barcelona were Frankish vassals nominated by the emperor then the king of France, to whom they were feudatories (801-987). In 987 the count of Barcelona did not recognize the French king Hugh Capet and his new dynasty, which put it effectively outside Frankish rule. Two years later, Catalonia declared its independence. Then, in 1137, Ramon Berenguer IV, Count of Barcelona, married Queen Petronila of Aragon, establishing the dynastic union of the County of Barcelona with the Kingdom of Aragon which was to create the Crown of Aragon. It was not until 1258, by means of the Treaty of Corbeil, that the king of France formally relinquished his feudal lordship over the counties of the Principality of Catalonia to the king of Aragon, James I, descendant of Ramon Berenguer IV. This treaty transformed the country's de facto independence into a de jure direct transition from French to Aragonese rule. As part of the Crown of Aragon, Catalonia became a great maritime power, helping to expand the Crown by trade and conquest into the Kingdom of Valencia, the Balearic Islands, and even Sardinia or Sicily. In 1410, King Martin I died without surviving descendants. As a result, by the Pact of Caspe, Ferdinand of Antequera from the Castilian dynasty of Trastamara received the Crown of Aragon as Ferdinand I of Aragon. His grandson, King Ferdinand II of Aragon, married Queen Isabella I of Castile in 1469; retrospectively, this is seen as the dawn of the Kingdom of Spain. At that point both Castile and Aragon remained distinct territories, each keeping its own traditional institutions, parliaments, and laws. Political power began to shift away from Aragon toward Castile and, subsequently, from Castile to the Spanish Empire. 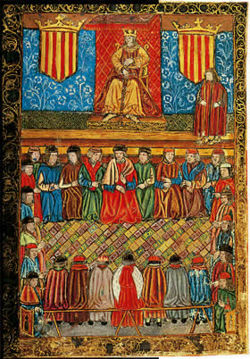 For an extended period, Catalonia, as part of the former Crown of Aragon, continued to retain its own usages and laws, but these gradually eroded in the course of the transition from feudalism to a modern state, fueled by the kings' struggle to have more centralized territories. Over the next few centuries, Catalonia was generally on the losing side of a series of local conflicts that led steadily to more centralization of power in Spain, like the Reapers' War (1640–1652). The most significant conflict was the War of the Spanish Succession, which began when Charles II of Spain (the last Spanish Habsburg) died without a successor in 1700. Catalonia, as the other territories which used to form the Crown of Aragon in the Middle Ages, mostly rose up in support of the Habsburg pretender Charles of Austria, while the rest of Spain mostly adhered to the French Bourbon claimant, Philip V. Following the fall of Barcelona in 1714, the special status of the territories belonging to the former Crown of Aragon and its institutions were abolished by the Nueva Planta decrees, under which all its lands were incorporated, as provinces, into a united Spanish administration, as Spain moved toward a centralized government under the new Bourbon dynasty. In the latter half of the nineteenth century, Catalonia became an industrial center; to this day it remains one of the most industrialized parts of Spain. In the first third of the twentieth century, Catalonia gained and lost varying degrees of autonomy several times, receiving its first statute of autonomy during the Second Spanish Republic (1931). This period was marked by political unrest and the preeminence of the Anarchists during the Spanish Civil War (1936–1939). After the defeat of the Republic, when General Francisco Franco came to power, his regime suppressed any kind of public activities associated with Catalan nationalism, anarchism, socialism, democracy, or communism, such as publishing books on the matter or simply discussing them in open meetings. As part of this suppression the use of Catalan in government-run institutions and in public events was banned. During later stages of the Francoist regime, certain folkoric or religious celebrations in Catalan were resumed and tolerated. Use of Catalan in the mass media was forbidden but was permitted from the early 1950s in the theater. Publishing in Catalan continued throughout the dictatorship. After Franco's death (1975) and with the adoption of a democratic Spanish constitution (1978), Catalonia recovered political and cultural autonomy. Today, Catalonia is one of the most economically dynamic regions of Spain. The Catalan capital and largest city, Barcelona, is a major international cultural center and tourism destination. Catalonia is the principal Spanish industrial area, with automotive engineering, electronics, chemistry, and textiles as growth industries. Services represent 60 percent of economic activity, industry 36 percent, and agriculture less than 4 percent. Barcelona and its zone of influence has a third less unemployment than the rest of the country. In 2007 the regional GDP of Catalonia was € 202,509 million and per capita GDP was € 24,445. GDP growth was 3.7 percent. Torre Agbar in Barcelona, a twenty-first-century skyscraper whose shape was inspired by Montserrat, a nearby mountain, and by the shape of a geyser rising into the air. Influenced by European standards more than Spanish ones, the province has associated with the Languedoc-Roussillon and Midi-Pyrenees regions to form a Euroregion. Catalonia is also home to a number of emerging industries with a strong potential for growth, illustrated by the fact that many foreign companies have invested in the biotechnology, aeronautics, renewable energy, and recycling industries. Catalonia has made a name for itself internationally in activities such as research and development, design and engineering, logistics, and shared services centers. One-fifth of Catalonia's manufacturing companies export, while 23 percent of them import. More than a third (36 percent) of Spain's exporting firms are established in Catalonia, with France, Portugal, Andorra, Italy, and Germany the main destination countries. Total Catalan exports reached €49.9 billion in 2007 and imports reached €79.1 billion; 75 percent is exported to EU markets and more than 60 percent is imported from EU countries. Catalonia accounts for more than 27 percent of total Spanish exports. Catalonia is the foremost tourist destination of Spain, particularly the city of Barcelona, the beaches of the Costa Brava at Girona, and the Costa Daurada at Tarragona. In the Pyrenees there are several ski resorts. Ten of the 46 Spanish savings banks are Catalan, and "La Caixa" is the first savings bank of Europe. The first private bank originated in Catalonia is Banc Sabadell, ranking fourth among Spanish private banks. The stock market of Barcelona, which in 2004 traded almost 205,000 million euros, is the second most important in Spain after that of Madrid. The main economic cost for Catalan families is the purchase of a house. According to data of the Society of Appraisal on December 31, 2005 Catalonia was, after Madrid, the second most expensive area for houses. Barcelona is the most expensive city in Spain for housing. The main airport is in Barcelona, but Girona, Reus/Tarragona/, and Sabadell also offer airports. There are 12,000 km of roads throughout Catalonia. The principal highway is AP-7, also known as Autopista del Mediterrani. It follows the coast from the French border to Valencia, located south of Tarragona. The main roads generally radiate from Barcelona. The A-2 and AP-2 connect to Madrid. 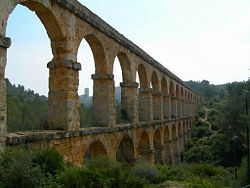 Catalonia saw the first railway construction in the Iberian Peninsula in 1848. Given the topography, most lines radiate from Barcelona. The city has both suburban and inter-city services. The main east coast line runs through the province and connects with French Railways. High-speed AVE (Alta Velocidad Española) services from Madrid currently reach Lleida, Tarragona, and Barcelona. The official opening between Barcelona and Madrid was on February 20, 2008. The journey between Barcelona and Madrid lasts about two and a half hours. Construction has commenced to extend the high-speed line north to connect with the French high-speed network. This new line passes through Girona and a rail tunnel through the Pyrenees. The capital city is Barcelona. Catalonia is divided into 41 comarques (counties) that are part, in turn, of four provinces: Barcelona, Girona, Lleida, and Tarragona. Its territory corresponds to most of the historical territory of the former Principality of Catalonia. Catalonia is a Spanish Autonomous Community with a high level of self-government. Politics of Catalonia are primarily related to the autonomous Parliament of Catalonia and the Generalitat institutional system. Since the restoration of the Generalitat through the return of democracy in Spain, the presidents of Catalonia have been Jordi Pujol (1980-2003), Pasqual Maragall (2003-2006), and incumbent José Montilla Aguilera. But regional Catalan politics also influences Spanish politics as a whole due to the presence of Catalan nationalist parties in the Spanish Parliament, whose political support is often required by any given winner of the Spanish general elections to form majorities. Catalan politics is also noted, to a lesser extent, for the influence exerted by the regional Social Democrat Party (PSC) on its sister major party, the Spain-wide PSOE. During the nineteenth and twentieth centuries, Catalonia was one of the main centers of Spanish industrialization. During these years, the struggle between the conservative industrial bourgeoisie and the working class dominated Catalan politics, as it did elsewhere in Europe. In Catalonia this situation was nuanced by the fact that immigrants from the rest of the Spain were an increasing portion of the workers, since the local workforce was not enough to cover the demands of a rising economy. Catalan nationalist and federalist movements arose in the nineteenth century, and when the Second Republic was declared in 1931, Catalonia became an autonomous region. Following the fall of the Second Republic after the Spanish Civil War of 1936-1939, the dictatorship of General Francisco Franco annulled Catalonia's autonomy statute and prohibited any public usage, official promotion, or recognition of the Catalan language. Its private everyday use was never officially proscribed by law but diminished because of the political situation. During the last decade of Franco's rule, there was a resurgence of nationalist sentiment in Catalonia and other historic regions of Spain, such as the Basque country. Following Franco's death in 1975 and the restoration of democracy by 1978, Catalonia regained its autonomous status. The Catalan conservative nationalist leader Jordi Pujol came to power in the first regional elections in 1980, and his two-party coalition, Convergence and Unity (Convergència i Unió, CiU), won successive regional elections by an absolute majority for 19 years and ruled the Generalitat for 23 consecutive years. The Spanish constitution of 1978 declares that Spain is an indissoluble nation that recognizes and guarantees the right to self-government of the nationalities and regions that constitute it, including Catalonia, the Basque Country, Galicia, and Andalusia. The Preamble of the 2006 Statute of Autonomy of Catalonia states the Parliament of Catalonia defined Catalonia as a nation but added that "the Spanish Constitution recognizes Catalonia's national reality as a nationality." After Navarre and the Basque Country, Catalonia is the Spanish region with the highest degree of autonomy. While the 2006 statute was approved by and sanctioned by both the Catalan and the Spanish parliaments, and later by referendum in Catalonia, it has been legally contested by the surrounding Autonomous Communities of Aragon, Balearic Islands, and the Valencian Community. The objections are based on various issues but foremost was the statute's alleged breaches of the principle of "solidarity between regions" enshrined by the constitution in fiscal and educational matters. As of November 2008, the Constitutional Court of Spain was assessing the constitutionality of the challenged articles. The historical region has gradually achieved a greater degree of autonomy since 1979. The Generalitat holds exclusive jurisdiction in various matters including culture, environment, communications, transportation, commerce, public safety, and local governments, while it shares jurisdiction with the Spanish government in education, health, and justice. Catalonia has its own police force, the Mossos d'Esquadra, whose origins trace back to the eighteenth century. Since 1980 they are under the commandment of the Generalitat, and since 1994 it is expanding to replace the Spain-wide Guardia Civil and Policía Nacional, which report directly to the Homeland Department of Spain. These corps are to retain a certain number of agents within Catalonia to exercise specific functions such as overseeing ports, airports, coasts, international borders, custom offices, identification documents, and control of armaments, among others. Most of the justice system is administered by national judicial institutions. The legal system is uniform throughout Spain, with the exception of so-called "civil law," which is administered separately within Catalonia. There is significant Catalan nationalist sentiment present in a part of the population of Catalonia, which ranges from the desire for independence from Spain expressed by Catalan independentists, to a more generic demand of further autonomy. The autonomous community of Catalonia covers an area of 32,114 km² with an official population of 7,364,078 (2008), of whom immigrants represent an estimated 12.3 percent. The Urban Region of Barcelona includes 3,327,872 people and covers an area of 2.268 km². About 1.7 million persons live in a radius of 15 km from Barcelona. The metropolitan area of the Urban Region includes cities like l'Hospitalet de Llobregat, Badalona, Santa Coloma de Gramenet, and Cornellà. Other important cities are Sabadell, Tarragona, Lleida, Girona, Mataró, and Reus. In 1900 the population of Catalonia was 1.9 million people and in 1970 it was over 5 million. That increase was due to a population boom in Spain during the 1960s and early 1970s and also to large-scale migration from the rural interior of Spain to its industrial cities. In Catalonia that wave arrived from several regions of Spain, especially Andalusia, Murcia, and Extremadura. According to the most recent linguistic census, a plurality claims Catalan as "their own language" (48.8 percent Catalan compared to 44.3 percent Spanish), and in most everyday uses, people who use exclusively Catalan or both languages equally are in the majority. And 53.4 percent of citizens declared Spanish as a native language, either exclusively or along with Catalan. Catalonia has hundreds of festes that go on around the region every week of the year. These are ritual-like celebrations that have been passed down through generations for more than 700 years. They are organized by the people of a town for their own enjoyment, not for any commercial interest. "Festival" (which also exists in the Catalan and Castilian languages), on the other hand, denotes an event that is usually organized by a specific group of people for a particular market and is often motivated by economic interest. “Festes” usually involve giants, devils, human castles, and processions and stem from medieval times, when fantastical dragons and giants were created to instruct people about religion in church services. These creatures became a part of the Corpus Christi processions that paraded through the town during the summer. The importance given to these folkloric elements has gradually increased over time and now they have assumed a national importance, being associated with the Catalan identity as something that is distinct from the rest of Spain. 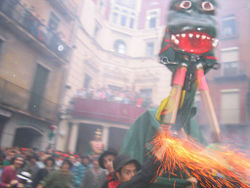 One such celebration is La Patum de Berga, or simply La Patum, a festival celebrated each year in the city of Berga during the Solemnity of Corpus Christi. It consists of several performances of mystical and symbolical figures that dance at the rhythm of a big drum and vivid music. The balls are marked for their solemnity and the use of fire and pyrotechnics. The festival was declared a "Masterpiece of the Oral and Intangible Heritage of Humanity" by UNESCO in 2005. Castellers are one of the main manifestations of Catalonian popular culture. The activity consists in constructing human towers by competing teams. This practice originated in the southern part of Catalonia during the eighteenth century. The sardana is the most characteristic Catalonian popular dance; other groups also practice Ball de bastons, moixiganga, or jota in the southern part. Musically the Havaneres are also characteristic in the marine localities of the Costa Brava, especially during the summer months when these songs are sung outdoors accompanied by a tasting of burned rum. As opposed to other parts of Spain, flamenco is not popularly performed, but rather the rumba is a more prevalent dance style. In addition to the traditional local Catalonian culture, people can enjoy traditions from other parts of Spain as a result of sizable migration from other regions. Originating in the historic territory of Catalonia, Catalan is one of the three official languages and has enjoyed special status since the approval of the Statute of Autonomy of 1979, which declares it to be the language "proper to Catalonia." The other languages with official status are Spanish, which is the official language throughout Spain, and Aranese (a dialect of Occitan spoken in the Aran Valley). Under the Franco dictatorship Catalan was, until the 1970s, excluded from the state education system and all other official and public use, including a prohibition against giving children Catalan names. Rural-urban migration originating in other parts of Spain and later foreign immigration as well reduced the social use of the language in urban areas. In an attempt to reverse this, the re-established self-government institutions of Catalonia embarked on a long-term language policy to increase the use of Catalan and has, since 1983, enforced laws that attempt to protect, and extend, the use of Catalan. Some groups consider these efforts a way to discourage the use of Spanish, while others, including the Catalan government and the European Union, consider the policies respectful, or even as an example which "should be disseminated throughout the Union." Today, Catalan is the language of the Catalan autonomous government and the other public institutions that fall under its jurisdiction. Basic public education is given in Catalan except for two hours per week of Spanish-medium instruction. Businesses are required to display all information (e.g., menus, posters) in Catalan under penalty of fines; there is no obligation to display this information in either Aranese or Spanish, although there is no restriction on doing so in these or other languages and this is often done, particularly in Spanish. The use of fines was introduced in a 1997 linguistic law that aims to increase the use of Catalan. The law ensures that both Catalan and Spanish—as official languages—can be used by citizens without prejudice in all public and private activities. Even though the Generalitat usually uses Catalan in its communications and notifications addressed to the general population, citizens can also receive information from the Generalitat in Spanish if they so desire. 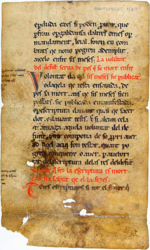 Also, starting with the Statute of Autonomy of 1979, Aranese (a dialect of Gascon) has been official and subject to special protection in the Aran Valley. This small area of 7,000 inhabitants was the only place where a dialect of Occitan had received full official status. Then, on August 9, 2006, when the new statute came into force, Occitan became official throughout Catalonia. Volcanoes: near the city of Olot and La Fageda d'en Jordà, an extinct volcano. Les Alexandrias - Rugged western hamlet located near the Aragonese mountain range. Famous for its bull fighting festivals in which the bull holds a red cape and bullfighters run after it. Catalonia is the richest region of Spain. While its economy has a basis in traditional industries such as textiles, other sectors are growing in importance, including automobiles and their accessories, chemicals, food, shipbuilding, and furniture. More recently, the manufacture of electrical appliances and computer and telematics equipment is also becoming increasingly important, as are graphic arts and publishing. Growth in construction is directly related to tourism development, which is likely to slow with the recession. The government is moving forward with a plan to upgrade its existing airports and build new ones. Its aim is to strengthen Catalonia's economy and help boost the Catalan aviation industry. Barcelona is also becoming a center of biomedical research and was named as the venue for the headquarters of the International Cancer Genome Consortium (ICGC). ICGC is a project with eight cooperating countries to research the genomic sequencing of disease. It has assigned the study of a specific type of cancer to each participating country. Spain's focus is chronic and usually incurable lymphocytic leukemia, the most common form of leukemia in adults in Western countries. The Catalan Ministry of Economy and Finances declared in late 2008 that it expected the Catalan GDP to enter a phase characterized by solid growth, despite the generalized slowing down of the advanced economies, with exports growing by 5.3 percent that year. The indicators also suggest, the ministry said, that the foundations of this growth will be more balanced. The slowing of home building and the deceleration of investment in construction will contribute to moderating demand on the whole, thus stabilizing prices and contributing to improving the competitiveness of Catalan products. ↑ 4.0 4.1 Government of Catalonia. Facts and Figures Retrieved February 20, 2009. ↑ Euroinvestor. Profile of "Banc Sabadell" euroinvestor. Retrieved February 20, 2009. ↑ Distribuciones De Frecuencia Marginales Del Estudio 2410 Cuestionario 0 Muestra 0 CIS. Retrieved February 20, 2009. ↑ Marian Hens. January 3, 2007. Catalans grapple with migrant influx BBC News. Retrieved February 20, 2009. ↑ Institut d’Estadística de Catalunya. 2003. Estadística Social Censos i enquestes Retrieved February 20, 2009. Iberia Nature. A guide to the environment, climate, wildlife, geography, and nature of Spain: Catalonia Retrieved February 20, 2009. This page was last modified on 17 January 2017, at 17:26.